Roseola is the most common in children under the age of three but may occur at any age. it's main significance lies in the sudden high fever, which may cause a convulsion. such a convulsion is due to he high temperature & doesn't indicate that the child has epilepsy. prompt treatment of the fever is essential. Fever: There are usually several days of sustained high fever. sometimes this fever can trigger a convulsion or seizure. otherwise, the child appears well. The Rash: The rash appears as the fever is decreasing or shortly after it is gone. it consist of pink, well-defined patches that turn white on pressure and first appear on the trunk. it may be slightly bumpy. it is spreads to involve the arms, legs and neck but is seldom prominent on the face or legs. the rash usually last less 24 hours. Other Symptoms: occasionally there is a slight runny nose, red throat, or swollen glands at the back of the head, behind the ears, or in the neck. most often there are no other symptoms. the disease probably caused by the virus and is contagious. contact with others should be avoided until the fever has passed. the incubation period is from 7 to 17 days. 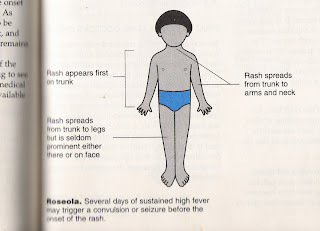 encephalitis (infection of the brain) is a very rare complication of Roseola. 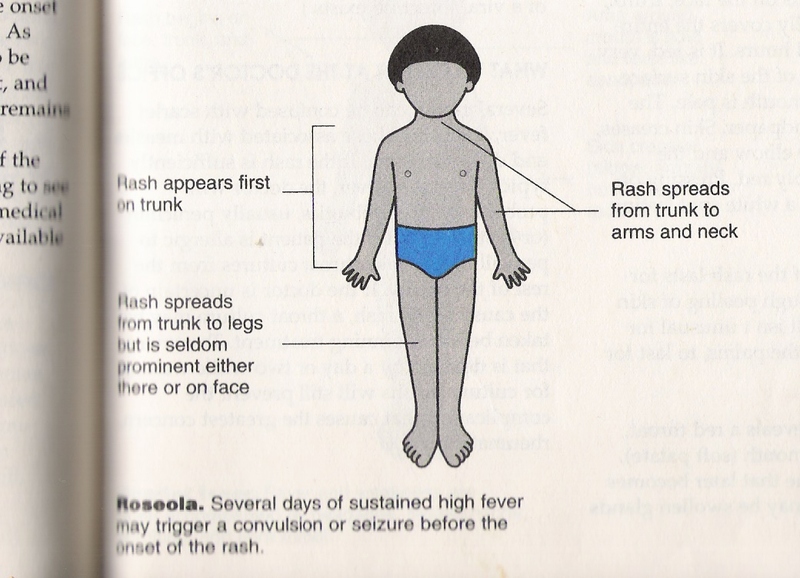 roseola is basically a mild disease. base on two principles, the first is effective treatment of the fever. the second is careful watching and waiting. the patient with roseola should appear well and have no other significant symptoms once the fever is controlled. if symptoms of ear infection (a complaint of ear pain or tugging at the ear) or cough occur, then the appropriate sections of this blog should be consulted. lethargy can be a warning sign of meningitis or encephalitis. if the problem is still not clear, a phone call to the doctor should help. remember that Roseola shouldn't last more than four to five day's. you should call your doctor if the symptoms persist. 1 comments for "Home Treatment For Roseola"